Regulators have approved a long-delayed biomass to energy plant that may produce up to 12 percent of the island’s power. The Big Island’s eucalyptus trees have been a financial albatross for two decades. Now there may finally be a use for the trees: burn them for electricity. Back in the 1990s, after the downfall of the sugar industry, large landowners on the Big Island were looking to do something with tens of thousands of acres of land on the Hamakua Coast so that it wouldn’t all flood onto the real estate market at once. So they decided to plant thousands of acres of fast-growing eucalyptus trees. Agreements were drawn up to sell the trees to a large Japanese paper consortium called Oji-Marubeni. But in order to meet the consortium’s needs, the plan also called for the state and the County of Hawaii to grow timber on about 10,400 acres of land that they’d gotten from the sugar companies in settlement for back taxes. That fostered a grassroots rebellion by Hamakua Coast residents. They were angered by timber company planes that had over-sprayed their homes while applying Roundup and Garlon to kill the cane for eucalyptus planting and unimpressed by a financial plan that would have created only about a tenth of the jobs that once existed on the sugar plantations. They also wanted that state and county land reserved for small farms. After hundreds of angry residents packed a DLNR hearing at a local high school gym in 1997, the agency backed down. The Oji-Marubeni deal collapsed, leaving over 30,000 acres of already-planted eucalyptus without a buyer. Since then, the trees have mostly gone unharvested, though some were recently sold to a paper company in China. Now the Public Utilities Commission has approved a plan by Hu Honua Bioenergy LLC to burn those orphaned trees to produce electricity. 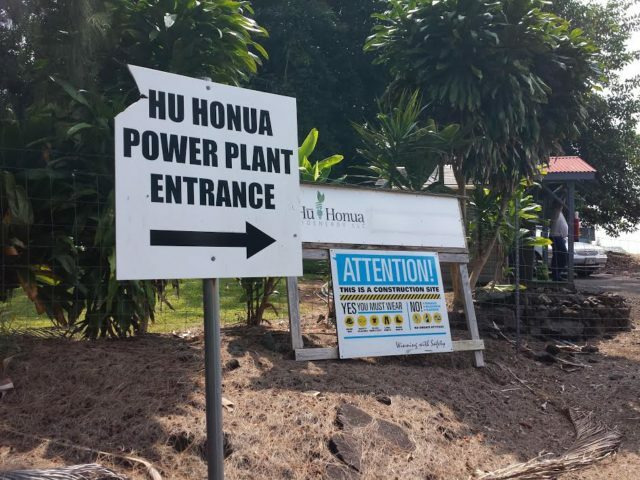 Hu Honua, which has mainland financing and a board consisting mostly of Oahu business people, was formed to renovate a plantation-era power plant in Pepeekeo, a few miles north of Hilo, to produce electricity from eucalyptus and other biomass. The company would burn 30 to 40 truckloads of wood per day, producing up to 12 percent of the island’s electricity. View of the Hu Honua renewable energy plant from a neighboring farm. The company’s owner, Island BioEnergy, is renovating a plantation-era power plant. The project is moving forward after years of delay. The company’s new owner, Island BioEnergy, has settled a federal lawsuit against Hawaiian Electric Light Company over a termination of a previous power production agreement and a bill for $35 million in unpaid bills from Hawaii Dredging and Construction, which the previous owner had hired to renovate the plant. 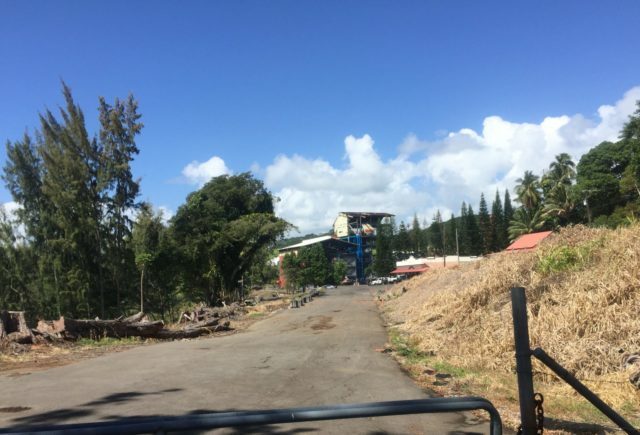 Harold “Rob” Robinson, president of Island BioEnergy, says the company has hired a new contractor, California-based Performance Mechanical to complete the renovation. The company says it will create about 200 temporary construction jobs and 30 permanent operations and maintenance jobs, with workers represented by local unions. The plant, they say, will spur other new jobs in local forestry, trucking and other industries. Opponents have challenged that assertion, noting all the fuel that will be burned by the logging trucks. But Robinson maintains that the trucks would run no matter who buys the wood and that his plant would use the wood near its source, rather than shipping it across the Pacific. The project’s most vocal critics are its next-door neighbors. In the years since the power plant shut down, the former cane fields around it have been converted into four agricultural subdivisions with a patchwork of small farms. “Everybody’s got something: coffee that they sell, cattle that they sell, cacao, pineapple, lychee, longan, avocado, taro,” says Rosemary Gonzalez. She and her husband Carlos live on a fruit farm on the closest lot to the power plant. The subdivisions own the private road that serves residents and the power plant. The Gonzalezes and some neighbors have a number of worries, including noise from trucks and construction, as well as wear and tear on the road. They say the company has made no agreement yet to help with the road’s maintenance or deal with noise concerns. Robinson says the company has discussed both daytime and nighttime scenarios for running the chipper plant. 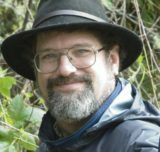 Another critic is Henry Curtis of the environmental nonprofit, Life of the Land, which filed a motion to intervene in Hu Honua’s PUC hearing. He notes that the plan contains a lot of speculation without commitments. The company says it will get most of its wood from the Hamakua Coast, for instance. But it also reserves the option of bringing wood in from plantations around Pahala on the Kau coast—raising the specter of logging trucks snaking along narrow, winding roads and driving through downtown Hilo—or even importing wood. Company spokespeople, including Robinson, have also talked about burning invasive trees such as albizia, but haven’t yet confirmed they will do so. Curtis also wonders if the power is a good deal for consumers. “Right now, we’re in a period of declining solar costs,” he said. On the same day that PUC approved Hu Honua’s proposal to sell its power at an average of 21 cents per Kilowatt hour, it approved a Kauai solar project that would charge only 11 cents per kilowatt hour, Curtis noted. Hu Honua’s average price over 30 years looks less than that of oil, though rate payers though the contract is actually expected to raise customer’s power bills for the first 11 years of the company’s HELCO contract. Robinson argues that although solar and battery technology have improved recently, those still can’t generate power 24 hours a day. “We’re a renewable that can replace on a one-to-one basis, a fossil fuel plant,” he says. Robinson maintains that the Pahala option would only be exercised when that wood wasn’t available, as when soggy conditions made logging nearby unwise. As the timber companies harvest, he says, they will also be replanting, making the resource renewable. The project also faces another opponent: time. Its financing (Robinson declined to say who the financiers were) may depend on earning a tax credit for renewable energy sources—a program that ends on Dec. 28, 2018. The plant must be finished and running by then. While the PUC hearing was a major hurdle, the company may face others. Curtis notes that if the company actually wants to generate more megawatts, it may need to file for a new clean air permit. It may also face challenges to its planned use of injection wells for hot wastewater, if that water is proven to enter the sea. Life of the Land or the other two intervenors, Tahiri Energy and the Consumer Advocate, may also challenge the PUC ruling.